If you weren’t already in love with Washington, D.C., I have one more reason for you to put it on your must-travel list: the new Walgreens D.C. flagship store. Walgreens, you ask? Yes, Walgreens! And let me tell you why. 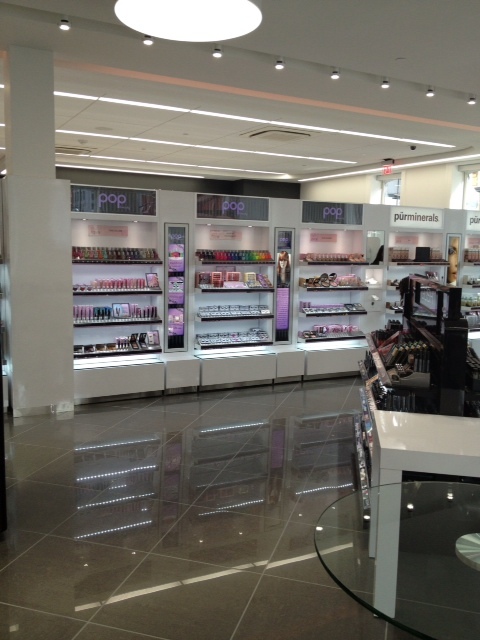 Last week, I attended the grand opening of the Walgreens flagship store Washington DC, and it’s beautiful. I might be in love. They are radically changing the way consumers shop at a drugstore chain and the pharmacy experience. There’s so much to say about the store, I don’t know where to begin. The Walgreens D.C. “Flagship” store is in an awesome location. 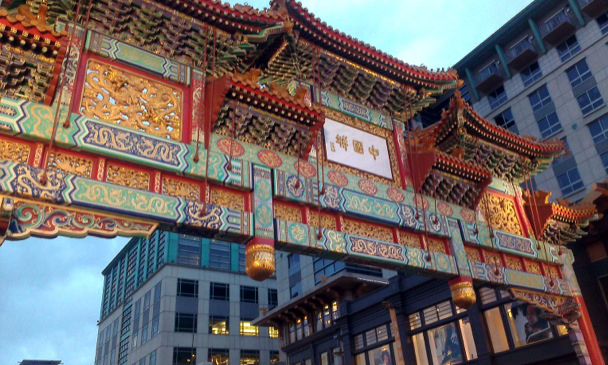 At the corner of Happy and Healthy, it’s right in the middle of Chinatown on the corner of 7th and H Street in Northwest D.C. You can’t miss it as it sits just below the beautiful Chinese arch that lets you know you’re in Chinatown (just in case you were confused). It’s two blocks away from the Verizon Center, where just about every major show in D.C. takes place. Case in point, the night that we were there, the Circus was in town. And it’s also a 5-minute walk from the D.C. Convention Center, both venues which I’ve recently visited for events. Not only is this new store convenient for visitors who have Chinatown, or the Verizon Center, or the Convention Center on their visit-D.C. agenda, but it’s also convenient for the hundreds of businesses and locals that frequent the area. The Fresh Market and a few extra lights and cameras for the opening celebrations. When I walked into the Washington D.C. Flagship store, it was bright, colorful, well-lit, inviting, and nicely organized. Forget everything that you THINK you know about Walgreens. I know I did. The 21,400 square feet store has three levels and is what I’d call a shopping mom’s daydream (okay, so maybe that’s more opinion than fact). My husband is lucky that we don’t live around the corner from here. A “quick run for some medicine” would turn into a three-hour shopping and relaxation excursion. On the lower level you have the pharmacy, Take Care Clinic, consumables, dry goods, and adult beverages. On the first level, there’s the Up Market, fresh food items, and photo area. on the second level, you’ll find the Beauty and LOOK Boutique. All in all, the store has 12 registers, all spread through the store. On the first level of the store, where you’d walk in, you will find all of the store’s fresh offerings, its Up Market brand items, and where you can take photos for passports or pick up photos. Forget about having to go to multiple stores to grab a sandwich, frozen yogurt, coffee, and treat. 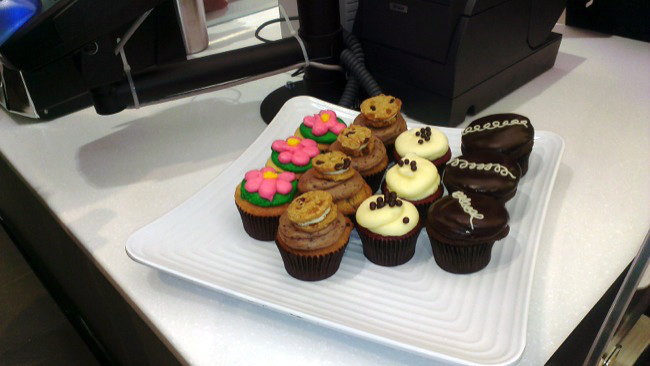 Fresh cupcakes delivered from a local bakery are served at Up Market. You can find them all here on the first floor. 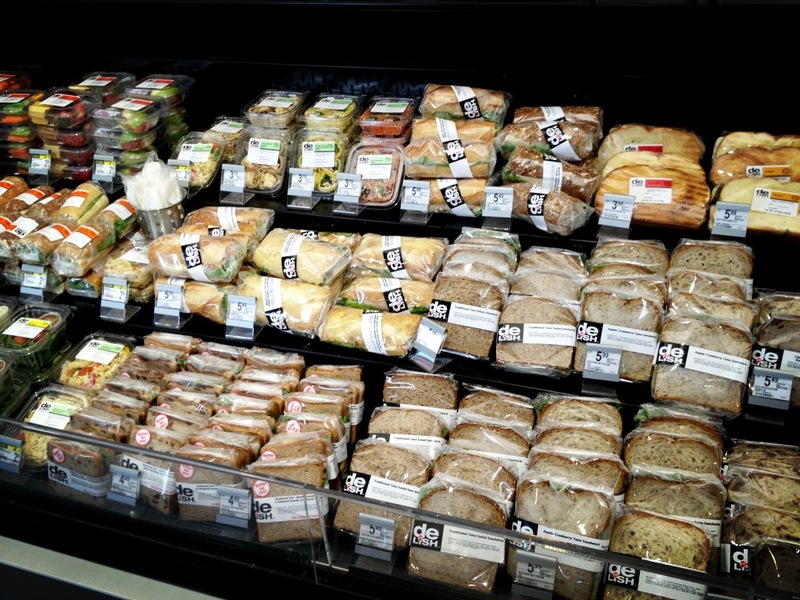 This Walgreens has hundreds of food items including produce for that quick non-supermarket run, on-the-go meal options such as wraps, sandwiches, and salads that are made fresh daily, as well as fresh bakery goods like cupcakes, scones, croissants, muffins and more. 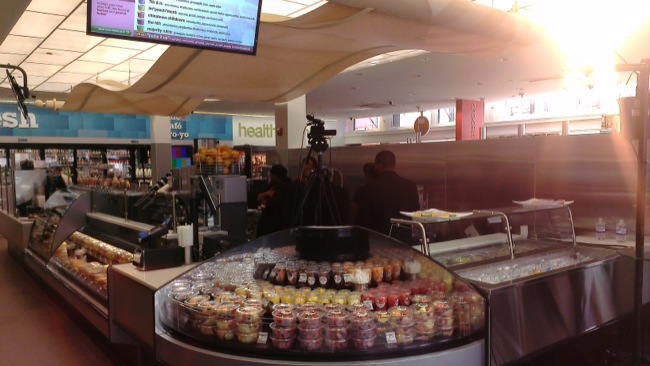 There’s an amazing juice and smoothie bar with fresh fruits and vegetables that are used in unique recipes, all of which are listed on a menu on an overhead plasma screen. Notice how many times I mention “fresh”? Yes, that’s the point – the store is fresh (to go a little old school on you), and, it’s selling fresh. Yummy! 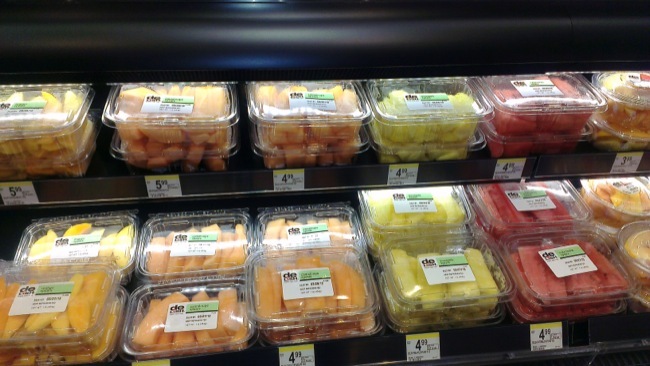 Fresh fruit available at Walgreens UpMarket on the First Level. If you want something a little warmer, the Upmarket Cafe offers a barista that prepares fresh brewed premium coffees and espressos. I had a delicious chai-tea latte made with soy while I was there. Yay! They offered soy milk. Two thumbs up! Perhaps, you want something a little less sophisticated and more fun like a drink from the Coca-Cola Freestyle machine which dispenses 130 varieties of Coca Cola fountain drinks, some of which aren’t normally found in the United States. 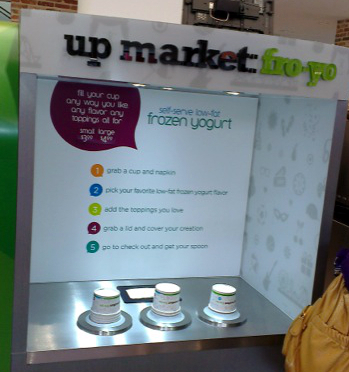 Up Market Frozen Yogurt section. Maybe the kids (or you) want something even cooler, like a cup of frozen yogurt. The self-serve fro-yo machine offers several flavors in addition to a toppings bar. This first floor has 9 registers, so don’t worry about waiting around too long to make your purchases. Going down the escalators into the lower level of the Walgreens is kinda like jumping in a rabbit hole where you’re excited and not quite sure what to expect after experiencing the awesomeness of the first floor. Needless to say, the lower level does not disappoint. Well-organized rows of consumables, dry goods, and over the counter drugs invite you to explore and shop. One of the things I loved about this level was that I could see myself coming down here to grab everything I needed for a party at a friend’s house. 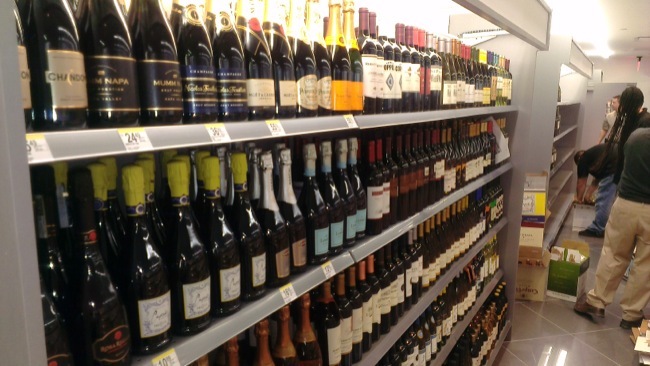 Bottles of wine line the walls of the first aisles, and chips, nuts, cookies, crackers, etc. are in adjacent aisles. 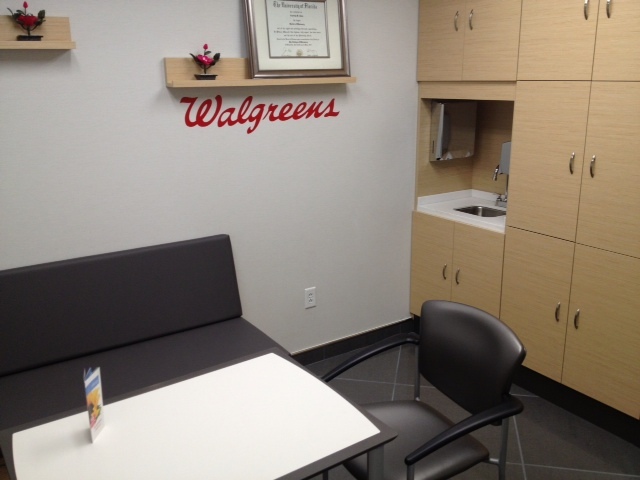 However, the best feature of the lower level is definitely Walgreens’ revolutionary pharmacy area and its Take Care Clinic. The enhanced, state-of-the-art pharmacy isn’t like anything you’ve seen. It’s designed to encourage greater interaction between pharmacists and patients, and make the pharmacy process more convenient overall for the consumer. There’s a desk for the pharmacist to sit at, which is in front of and away from where prescriptions are filled (which is concealed behind a frosted glass window). You can stop at the desk to ask the pharmacist a question or you can have a chat in the adjacent consultation room. If you’re there in a hurry, or know what you need, there’s an iPad equipped health guide to help you navigate a wide range of health and wellness products as well as Express Rx kiosks for swift checkout. Steps away from the pharmacy area is the Take Care Clinic which offers a wide range of health care services, including vaccinations, health tests, physicals and treatments for minor illnesses and injuries. Ever seen a price list at your doctor’s office? Well, guess who has one displayed on a plasma screen for complete transparency? That’s right, the Walgreens Take Care Clinic. Practical and convenient. This puts the healthcare process back in the hands of the patient. I see it as a sort of decentralization of the family doctor process. No more waiting weeks to get a simple sports form filled out for your child. 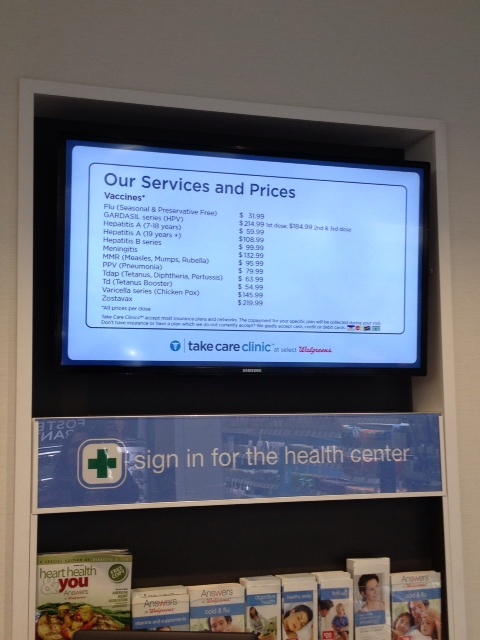 The prices listed for services were affordable, even if you don’t have insurance, which Walgreens accepts. Now this is the level where you really forget where you are. Riding up the escalator to this floor is like an ascent into me-time Heaven. I was sad to leave the space. This is where we ladies could really lose track of time. No, you’re not in Macy’s – this is the Look Boutique on the 2nd level. 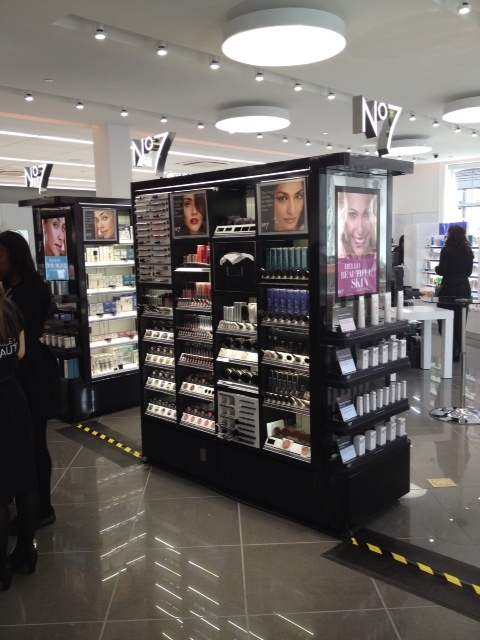 The second level is where you will find the Look Boutique and the Beauty department. If you want a quick manicure, there’s a Nail Bar waiting to spoil you. And at $12 a manicure, you’ll definitely be spoiled. Say you want to get your eyebrows shaped – there’s an Eyebrow Bar for that! The LOOK Boutique department features dozens of prestige and niche cosmetic, skincare and hair care brands that you won’t typically find in drugstores. These are some of your higher-end brands that you may see in other beauty-specific shops or even overseas, such as No. 7, Britain’s leading skincare brand, and Gosh skincare out of Denmark. There are dozens of other brands as well as a scent bar, petting station (to touch and feel makeup brushes before you buy), a section of high-end blow dryers, flat irons, and curling irons, and much more. Walgreens D.C. Flagship store is doing its thing in changing the shopping experience at a pharmacy chain store – it’s like nothing you’ve experienced. The company has 5 other flagship locations in Los Angeles, Chicago, Vegas, New York, and Puerto Rico, all designed to complement the communities within which they exist. The company’s core purpose is to help people get, stay, and live well. And for the residents and visitors of Washington, D.C., I think this store will do just that. You can check out more of my pics from the store and other information about Walgreens as well here. I was invited to the opening of the Walgreens store opening by Collective Bias. I was compensated as part of a social shopper insights study for Collective Bias and Walgreens #CBias #SocialFabric. All opinions, of course, are my own. LOL! Did I transport you back to that happy place on the corner? Awesome pics! You rocked this! Thanks CanCan. I think the pics speak for themselves of how awesome that store truly is. I’ve been trying to find a good excuse to go back to the neighborhood – think I don’t need one. It really isn’t your average Walgreens..at all. Their flagship stores are the only ones that look like this. Unfortunately. Well, if you come visit me in D.C. I will take you to this one.